When Carolina Paschoal graduated from law school in São Paulo, Brazil, she didn’t expect to find herself in an office arranging to have a pair of camels walk down Sixth Avenue in Manhattan. Nevertheless, as vice president and intellectual property (IP) counsel for fashion mainstay Kate Spade & Company, Paschoal has learned that she’ll need to be ready for any number of unique projects—even the occasional dromedary. Long before she was figuring out how to get a camel into New York City, Paschoal grew up on the path toward a career in law. When she was a child, her family traveled extensively and spent time in the United States, Brazil, and Chile. When she turned eight, Paschoal asked her father for a dog, only to be told that she would have to wait until they were settled into a house rather than moving between apartments. In a sign of what was to come, she immediately drew up and presented a “contract” with those terms, insisting that he sign it. Two years later, they moved into a home in Santiago, Chile, and Paschoal was ready. “I came up with my piece of paper and said, ‘Okay, here it is. Now you have to live by what you signed,’” she says. Those skills served her well, leading her through both a JD and an LLM at the Universidade de São Paulo. After some time as an IP associate in Brazil, Paschoal and her husband moved to the United States for a job he’d been offered in Chicago. In order to continue following her passion for the law, she enrolled at the University of Chicago’s law school. From the start, she was struck by the major differences between the way law is taught in South America and in the United States. No matter the differences, Paschoal adapted and learned quickly, earning her master’s degree and working her way up to a partner position at Kirkland & Ellis. After six years with the major law firm, a headhunter called with an offer seemingly tailor-made for her. Beyond those strengths, Paschoal’s most important qualifications for the role were her intense curiosity and passion for learning. With DirecTV, she learned about broadcast content and how it was delivered via satellite, telecom regulatory work, compliance, and more—all outside the traditional purview of an IP attorney. After a little more than four years with the organization, it was acquired by AT&T, and Paschoal decided it was time to find her next big challenge and opportunity to learn. That next step came in the form of an IP role in another unique, creative-driven industry, a position that would mean a similarly diverse set of responsibilities. “Doing what I like to do, plus doing it in an industry that’s so creative and exciting as fashion? That seemed fun,” Paschoal says. It wasn’t only the fashion industry in general, but also Kate Spade New York, a brand she admired and was already part of her collection. The role gave her a chance to learn about the industry, and also meant she’d need to learn new ways of working. 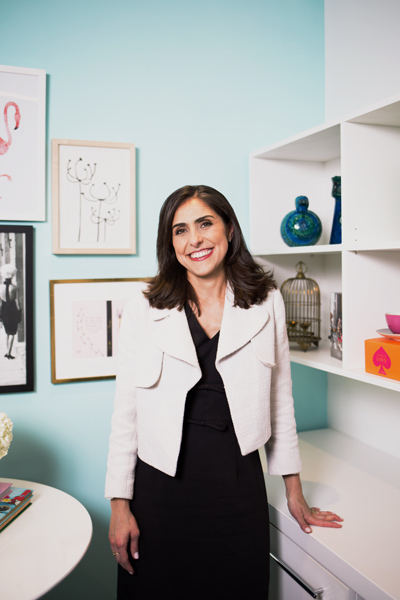 Rather than having a team as she did at DirecTV, Paschoal became the sole IP attorney at Kate Spade, supported only by a senior trademark specialist. She was welcomed eagerly by her fellow employees. As IP and licensing are major aspects of Kate Spade & Company’s business, having someone able to cover and strengthen every aspect of those concerns makes Paschoal a key driver for almost every project. In order to keep track of everything from licensing new products to helping ensure celebrity participation in brand films and events, Paschoal emphasizes the importance of prioritization and organization. The company’s products fall into two major categories: main line products and products that rely on third-party licensees. The former, which includes handbags and small leather goods, are developed entirely in-house, while in the latter, Kate Spade & Company relies on the manufacturing expertise and distribution knowledge of its licensees. These deals involve shoes, home products, and more. In every case, Paschoal handles licensing the trademark to these producers and works with them on the distribution plan. Paschoal is involved in far more than the creation and licensing of products, however. She’s involved in every step, from concept planning through marketing to keeping a constant eye on the organization’s IP. She’ll work with the design team as they develop sketches of a product, followed by the product development bringing those sketches to life, the marketing team creating campaigns, the social media team on messaging, and the e-commerce team on selling the finished product. “I see the process from start to end. Sometimes I see something on the design phase, and when I’m at the marketing stage months later, I can identify the product transformation. I see the macro, the whole chain, the full cycle,” she says. Though Paschoal works with every team in the organization, she seems to brighten up a little when it comes to the creative marketing team—and that’s not just because of the camel on Sixth Avenue. The company’s recent Miss Adventure series of web videos demonstrates that focus. In the series, celebrities such as Zosia Mamet, Kat Dennings, and Lola Kirke star in creative short films that exemplify how a “Kate Spade girl” feels, looks, and acts. The marketing team ensures to bring Paschoal in at every step. One of Paschoal’s major tests came during a recent Kate Spade New York fashion show at the Russian Tea Room in Manhattan. For that event, Paschoal needed to help with the legalities surrounding securing models, coordinating with celebrities who attended, live-streaming the show, and securing music rights, as the spring and fall 2017 collections were shown on two separate floors, simultaneously. In other words, the totality of her role was summed up in a single day.